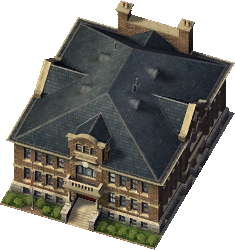 The Private School is a Civic Reward Building that provides Education to your Young Sims. There are three variants of the Private School which are notable for being completely free to place and requires no maintenance. They also include a built-in Park Effect, the strength of which varies between the three versions, to attempt to draw high-wealth citizens to it by increasing local desirability; provide an inherently higher EQ boost; and cover the entire Grade spectrum. They are also the only service in the game that discriminates according to Wealth by providing no effect at all to low-wealth citizens. R§§§ Population in excess of 750 Sims. Average School Grade less than 90. R$$$ Population in excess of 3,750 Sims. Private School Variant 1 has been built in that city. R$$$ Population in excess of 7,500 Sims. Private School Variant 2 has been built in that city. As neither their Capacity or Coverage Area can be adjusted to keep enrolment below their very low capacities, a Private School can become overloaded create a negative impact on your government-funded Public system, bringing down your city-wide EQ. This page was last modified on 5 February 2014, at 15:06.